In 1947 the Brooklyn Dodgers broke baseball’s color barrier when they brought Jackie Robinson into the major leagues. The same year saw the retirement of Hank Greenberg who was the first great Jewish superstar. Hank consoled Jackie that year, pushed him to persevere, and assured him things would work out for Jackie in the end as they had for Hank. Robinson listened, calling Greenberg "a high class gentleman." Aviva Kempner’s loving documentary, The Life and Times of Hank Greenberg, is full of such vignettes. It is split evenly between discussions of Greenberg’s baseball exploits and his accepted role as model for a generation of Jewish children. As Walter Matthau says, "Hank Greenberg made me realize I didn’t have to be a cutter or a presser in the garment district. I could do anything I wanted." Actor Michael Moriarty’s grandfather George Moriarty was the home plate umpire on the last day of the 1938 season when Greenberg was chasing Babe Ruth’s home run record. It was before the advent of night baseball. Moriarty kept the last game going until darkness made it impossible to continue and Greenberg missed tying the record by two home runs. Not everybody was on Greenberg’s side. The 1930s witnessed an abundance of anti-Semitism in much of America, and nowhere more so than in Detroit, home of Henry Ford and the ultra-right wing Father Coughlin. 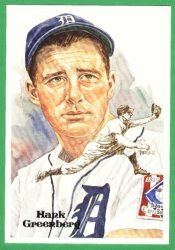 It was ironic that Greenberg was the recognized star of the Detroit Tigers during most of that decade, leading them to the World Series in 1934-5 and 1940. Baseball fans will relish the wonderful World Series footage seen here of Greenberg’s G-Men (Greenberg, Charlie Gehringer and Goose Goslin) taking on St. Louis’s Gas House Gang. There are interesting shots of many famous baseball players, perhaps none more interesting than one taken at an all star game where the 6’4" Greenberg is seen towering over such stars as Babe Ruth, Lou Gehrig, and Rogers Hornsby. There is an amusing anecdote from Greenberg’s rabbi who recalls that the congregation gave Greenberg a standing ovation as he walked into synagogue on Yom Kippur, 1934. He had shocked the baseball world by deciding he would not play baseball on the holiest Jewish holiday, out of respect to his parents. The rabbi says that Greenberg was at least twelve inches taller than everyone else in the building. Greenberg’s career, like so many others, was interrupted by World War II. He served in the army from 1940-45, and yet when he came back to the team mid-season in 1945 he was still able to clinch the pennant for the Tigers by hitting a grand slam home run in the ninth inning of the final game. His star had never been higher. The interviews with Greenberg himself, done in the 1980s, show a self-effacing man giving credit to everyone he played for and against, and holding grudges against none. As far as anti-Semitism goes, Greenberg says he seldom felt it. Listening to him talk you almost believe him. It is easy to see how this man rose above the catcalling and futile attempts to ruffle him. It is clear, too, why his advice to Jackie Robinson a decade later was taken as seriously as it was. Kempner has taken twelve years to complete her loving biography of a baseball legend. It opens and closes with a sweet touch: Mandy Patinkin singing Take Me Out To The Ballgame in Yiddish. Hank Greenberg would have enjoyed the music and loved his terrific movie.